Posts tagged "free camping tasmania"
The Bay Of Fires is a world-renowned, spectacular region of Tasmania north of the small coastal town of St. Helens on Tasmania’s far north-east coast. At Bay Of Fires, you will find pristine white sandy beaches, sparkling blue water and granite tinged with orange lichen. Cosy Corner North is one of a number of popular camping sites at Bay Of Fires with many camping areas immediately nearby and to the south. Cosy Corner North is best accessed off The Gardens Road, app. 5.5ks along Binalong Bay Road. This spot is suitable for larger caravans, campervans, motorhomes and other big rigs. At Cosy Corner North you will find camping suitable for campervans and motorhomes. The camping locations are easily accessed by turning off Binalong Bay Road, where you will only travel app. 200 metres. Please note you must carry your own drinking water and firewood. Dogs are OK, but must be kept on leads and under control at all times – a ranger patrols the camping areas Bay Of Fires. There are excellent pit toilets at Cosy Corner North campground. Long walks on the beach, and beach fishing, are popular activities at Cosy Corner North. Arthur River is a small township in the northern part of the West Coast of Tasmania, Australia, and is well known for the Arthur River Cruise and Tarkine Wilderness. At the 2006 census, Arthur River and the surrounding area had a permanent population of just 120 people. The Peppermint Campsite is signposted along the Arthur River Road near the Ranger’s Station and is close to the Manuka Campground and Prickly Wattle campground. Peppermint offers limited access for campervans, motorhomes and caravans, but is perfectly suited to tent camping. We recommend that if camping in a bigger rig, that you first try the much bigger Manuka Campground. Also in this area is the Nelson Bay Campsite that is located just out of the Arthur River community. Peppermint features excellent secluded sites; there is river water (water must be boiled) and pit toilets. Fire drums are provided. Watersports are popular at Arthur River including sailboarding, surfing, snorkelling, canoeing, fishing (saltwater and freshwater), beach combing and river cruises. There are also bush walks, ecotours and 4WD tours. If you prefer, simply relax and see native Tasmanian wildlife including Tasmanian Devils, wallabies, wombats, sea eagles and a variety of native birds. You can also visit the Tarkine wilderness, explore remote coastline in the path of the roaring 40s at places like Couta Rocks and Temma. The Arthur River Cruise is recommended when staying in this area. This campsite in Arthur River has a barbeque, sites are on the small side but large rigs can find a camping spot at the neighbouring campgrounds of Manuka or Prickly Wattle. You must carry your own drinking water, or boil the water supplied before drinking for at least 3 minutes. You can use collected driftwood for campfires, or branches that have fallen off trees. There is a ranger station at this location, and the Arthur River store where you can buy petrol, food and grab a coffee is immediately opposite the Peppermint Campground Arthur River. Dogs are OK, but must be kept fully under control at all times and on a lead. Campsites are from $13 per night for 2 persons for an unpowered site – please note there are no powered sites at Peppermint Campground. The Bay Of Fires is a world-renowned, spectacular region of Tasmania north of the small coastal town of St. Helens on Tasmania’s far north-east coast. At Bay Of Fires, you will find white sandy beaches, sparkling blue water, and granite tinged with orange lichen. At Grants Lagoon free camping Bay of Fires, you will find an open, grassy area that has boat access to the lagoon and sites suitable for campervans, motorhomes, and caravans. A day use area is located nearby with access to the beach. To access Grants Lagoon, head along Binalong Bay Rd (C850), turn left after app. 8 km to the Gardens – the Grants Lagoon track is signposted app. 1.5 km past the turn-off. In this area, visitors can enjoy a range of beach activities such as walking swimming and boating perfect white beaches contrast with brilliant turquoise seas and granite headlands tinged with orange lichen. You can camp at no cost – yes free camping Bay of Fires, in the many designated areas such as Grants Lagoon but also Jeanneret Beach, Swimcart Beach, Cosy Corner, Sloop Lagoon, Big Lagoon, and Policemans Point. Please note, the facilities are very basic – you will need to carry your own food and water. Many campsites are sheltered, being popular with fishermen, photographers and birdwatchers. At Bay of Fires can expect to experience grey kangaroos, wallabies, wombats, echidnas and possums plus many sea and forest birds. Allports Beach campsite Flinders Island, located app. 20 kilometres north of Flinders Island near the small town of Emita camping area Allports Settlement Point is located opposite a beach with the campground location signposted off Palana Road. Campers should carry their own drinking water and firewood and campers on Flinders Island are asked to take care not to pollute any local water systems and to be cautious when drinking water. The Allports Beach Flinders Island campsite, camping Tasmania, is approximately 100 metres from the beach – Allports Beach features free gas barbecue and toilets Allports Beach barbecue area is day use only and donations are encouraged to use the free gas BBQ. Allport Beach is app. 150 m long, with a slight curve, is north-facing and quite steep. Allports Beach camping area is bordered by dune-capped granite points, with some boulders outcropping along the eastern end of the beach. The Allport Road runs down the backing slopes to a small reserve with a carpark, picnic area and toilets at the eastern end of the beach. You can camp at Allports Beach campsite Flinders Island at no cost for a maximum of 3 weeks. Bookings are not possible – camping is on a first, first-served basis. It is recommended that you call the Flinders Island Parks and Wildlife Service on (03) 6359 2217 prior to camping at Allports Beach, just to check availability. Prickly Wattle Campground offers fairly basic, but excellent bush camping at Arthur River on the C214 road, on the wild West Coast of Tasmania. There are a large number of sheltered sites at this large camping ground, which is set next to the main road and is some 2 km south of the township of Arthur River. 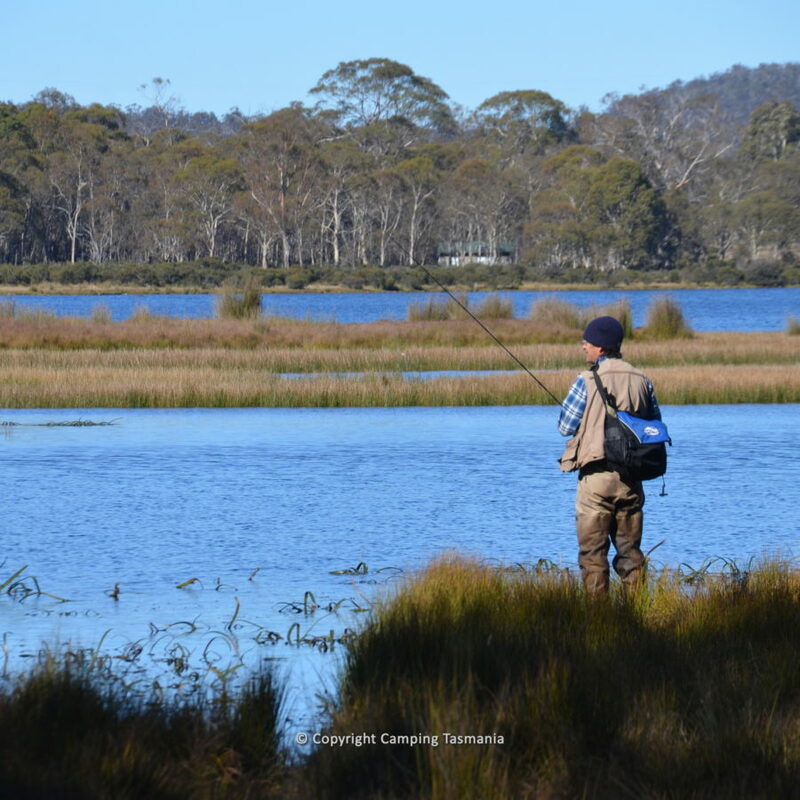 Arthur River, in the Tarkine, is well-known for its excellent fishing including both salt (salmon is a popular catch) and freshwater options (trout and bream). The Arthur River Cruise is a must if you are camping at Arthur River, where if you are lucky you will see the beautiful White Breasted Sea Eagle. To camp at Prickly Wattle, you will need to be largely self-sufficient, and carry your own water – basic food provisions can be bought in Arthur River but please note this is a small settlement so the shops are nothing more than small general stores. There are very basic long drop toilets at the Prickly Wattle Campground. Can you collect firewood that has fallen from trees, but under no circumstances is wood to be cut from trees. Dogs are OK, but must be kept under control at all times. This campground is patrolled by the local Parks and Wildlife Ranger. There are other excellent camping options in Arthur River including Manuka, Nelson Bay and Peppermint campgrounds. You need a permit to camp at Prickly Wattle, which can be purchased in Arthur River from the Tarkine Visitor Centre. If arriving after hours, there are facilities to register and pay camping fees. The campsites are patrolled by a ranger and checks are made to ensure that fees have been paid.